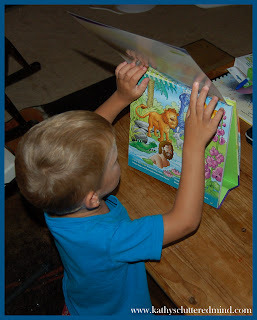 Looking for a way to teach your children about dinosaurs from a biblical perspective? Then you will love this awesome teaching resource. If you are familiar with the products Masterbooks carries you know that D is for Dinosaur has been around for awhile but this is the NEW and improved revision which features amazing new illustrations and lots of added resources to help you share important Biblical truths with your children from A-Z. D is for Dinosaur uses very fun rhymes and amazing illustrations to engage children as you work through the alphabet and learn about dinosaurs. The words on each page share Gods Word in a very easy to understand format. The majority of the scripture used throughout the book is from Creation through the Genesis Flood. The way the book is arranged makes it great for every Christian education venue, including homeschool and Sunday school. The updated D is for Dinosaur book has a look and format very similar to A is for Adam. It is a 10 x 10, 84 page, flip-top spiral bound book with a fold out bottom which allows the book to be stood up. The book is written by Ken & Mally Ham. "D is for Dinosaur, but you'll have to wait, 'Cause on day four other things God did make. He formed the sun, the stars, and the moon. Are you ready? We'll see those dinosaurs soon!" Rowyn checking out the book some more after I read it. There are several ways you can utilize this book. I choose to read through the entire book once without utilizing any of the lessons. The kids were full of questions which of course were answered most of the time on the next page(s). I liked how the story engaged the children and made them think of great questions. One of the things the kids noticed first was how friendly the dinosaurs were and how they lived peacefully with Adam and Eve and the other animals in the garden. Gwyn asked, "Why do the dinosaurs not attack and eat Adam and Eve and why is T-Rex eating fruits and vegetables? He is a meat eater." But on the next few pages the kids learned that sin made flesh violent. Next you will work your way through the alphabet. The flip top format is set up so that the illustrated rhyming pages face the child while the back features the lesson. Stuff To Do - Fun projects and activities. One of the projects is creating a mini timeline where children will track what occurred on each day of Creation. EXTRA resources...yes there is more!!! Make sure you download these great coloring pages to go along with the book. These are so cute! **Would you like to win a copy of D is for Dinosaur? 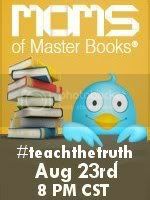 Then join us for the next Teach The Truth Twitter Party. Prizes: Copies of D is for Dinosaur. If you don't win at the party you can buy the book either directly from New Leaf publishing or Amazon. The book retails for $16.99 but on Amazon I have seen it as low as $12.74. *Disclaimer - I received a review copy of D is for Dinosaur. I was not compensated for my review and all opinions are our own! Many of the links found on my side bars and in my blog posts are affiliate links. As a result, I might get paid money and I will most likely spend the money on homeschool supplies.